The world’s first real-time flow monitoring technology for block caves. 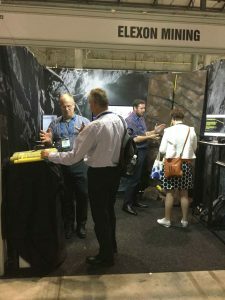 Developed and manufactured by Elexon Mining, the Cave Tracker System was devised in collaboration with Newcrest, Mining3 (formerly CRC Mining) and Rio Tinto. Cave Tracker provides real-time insight into cave flow and cave propagation which mitigates the risks of block caving. For the first time ever, you can see what’s actually happening in your block cave. For example, you will be able to detect air gaps forming and therefore, manage them before they pose a threat. Cave Tracker uses magnetic beacons which are embedded in the orebody. The technology within these trackers spin at a particular speed to generate a magnetic field. The system operates through a series of beacons that are embedded in the mine, which can be tracked in 3D as they move with the fragmented rock of the orebody. The ability to track beacon movement allows mine engineers to determine which parts of the cave are moving and which parts are not. These beacons are wireless and robust. They are able to remain underground for years and easily withstand the rigours of the harsh underground environment. 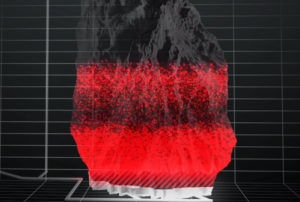 Produced by Rio Tinto, this video explains how cave mining works. It focuses on how Rio Tinto intends to use Cave Tracker in their cave mining operations at Oyu Tolgoi, Mongolia. A rugged cylindrical fiberglass enclosure containing a strong magnet, batteries and electronic circuitry. A microcontroller in the Beacon is programmed to control an electric motor which spins the magnet at desired intervals. Beacons are embedded in a mine’s ore-body so that their 3D position may be tracked at regular intervals by Cave Tracker System Detectors. Beacons are intended to be installed in deep mine holes. Calibration Beacons are identical to Beacons, with the exception that they can be powered and can communicate with the outside world via an umbilical cable. A rugged cylindrical fiberglass enclosure containing a sensitive magnetometer and various electronic circuitry including a small computer. Detectors are strategically placed throughout the mine so that the system may detect the 3D positions of Beacons installed in the mine. Detectors are also intended to be installed in deep mine holes. Detectors send the measured Beacon ranging information via the Communication Adaptor Module’s (ITCAM) serial link to the Cave Tracker Management System server for data storage and analysis. The Communication Adapter Module provides a DC power and serial data communication link for Detectors and Calibration Beacons. Messages between Cave Tracker Management System, Wireless User Interface and Calibration Beacons/Detectors are relayed through the ITCAM. The CTMS is responsible for data storage of Detector range readings, converting received Detector ranges into 3D Beacon positions, and managing installed Cave Tracker System Devices. A small ruggedised laptop + USB Activation Wand is used for system commissioning and the wireless activation of Beacons prior to installation. Elexon Mining Project Manager, Dylan Whiteman, delivered a paper at Massmin 2016. This paper featured world-first results from Cave Tracker monitoring at Argyle Diamond mine.